This mixture of Mexican chorizo and chicken is something I have enjoyed on the menus of a couple of Richmond area Mexican restaurants, although I have never seen it on the menus of Mexican restaurants in Texas, and there are very few references to it on the internet. It is really a very simple idea. Here is how I made it last night as a taco filling. This is one of those dishes which tastes better than it looks in a photograph. Take the chorizo, remove any casing, and fry it over medium heat in a large skillet, breaking up any large pieces. After it has started to brown, add the onion slices, and cook together until the chorizo is browned and the onions are softened. Remove the cooked chorizo and onion to a bowl. Remove any excess fat from the skillet (or add some oil if the skillet is very dry). Add the chicken slices and saute until cooked through and golden. Return the chorizo and onion to the skillet, and add the Velveeta and pickled jalapenos. Stir well until the cheese is all melted and mixed with the chorizo and chicken. Serve as a taco filling or on top of rice. 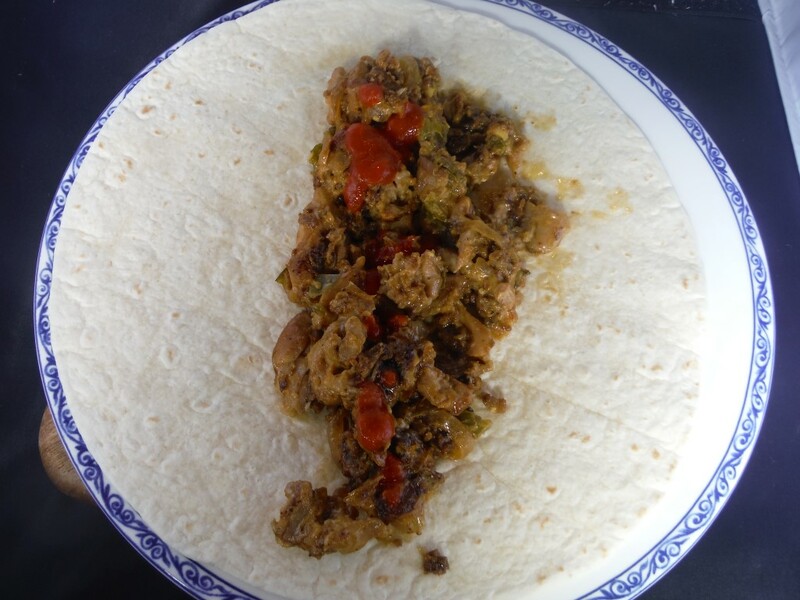 In the photo, it is served with some hot sauce and used as a burrito filling.